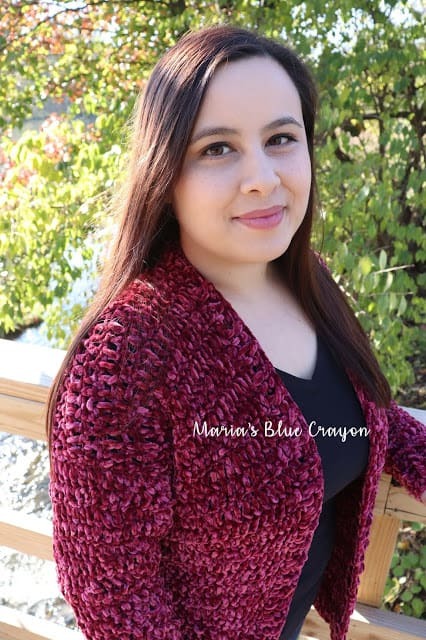 Scroll down for the Free Crochet Pattern for the Velvet Cardigan Sweater. The Crochet Velvet Cardigan has been a huge work in progress for the past month! 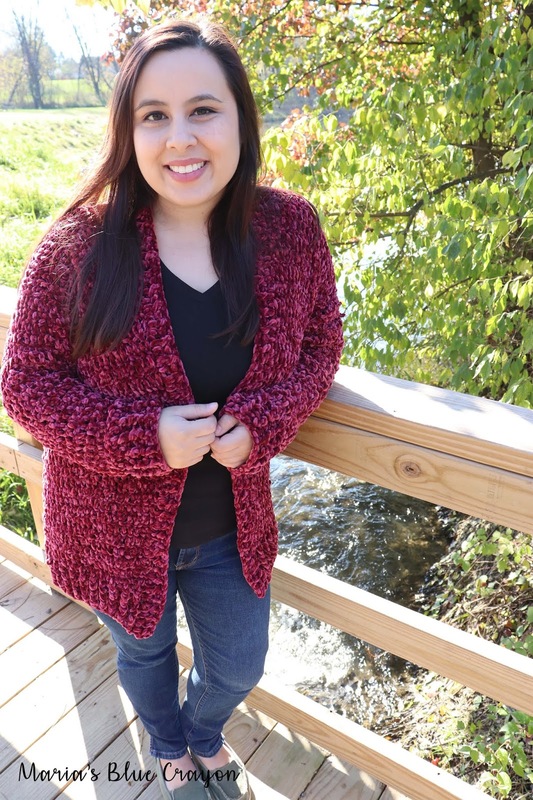 My wonderful pattern testers did such a wonderful job and I’m so excited to share with you the final crochet pattern for this cardigan. When I first picked up the Bernat Velvet yarn, I knew I wanted to wear it. This cardigan is everything I dreamed it would feel like and more! It’s comfortably fitted and feels so soft against the skin, it’s incredible. The wonderful thing about this crochet velvet cardigan pattern is that it is easy to make and uses only basic stitches and construction. If you know how to double crochet, you know how to make this cardigan. 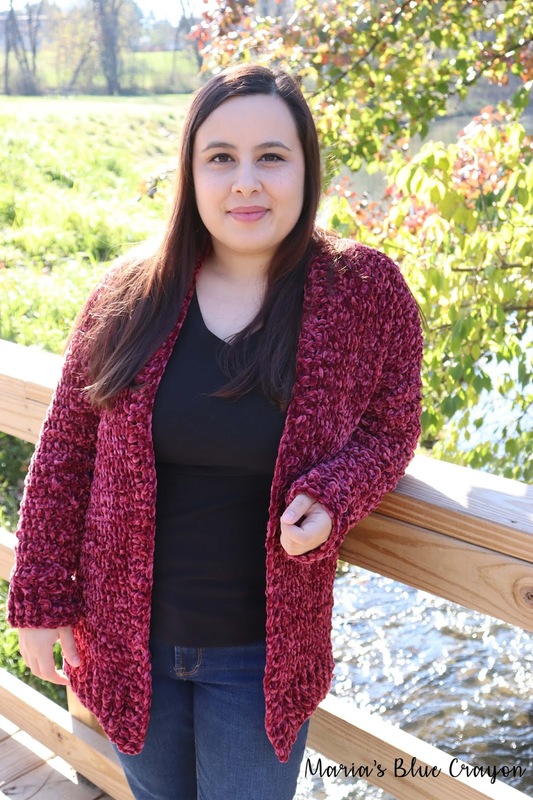 With the velvet yarn being a bulkier yarn, it also doesn’t take much time to crochet this cardigan. I would say in total, it took me 3-4 sittings to make this entire cardigan including the seaming. The yarn is so wonderful to work with, you won’t want to put it down! Something different I did this time around with pattern sizing for a cardigan is adding heights to the sizes. I’m 4’11” so I have always calculated the measurements to suit the average height person when writing the pattern. Well, I know from a lot of you that I’m not the only shorty out here! 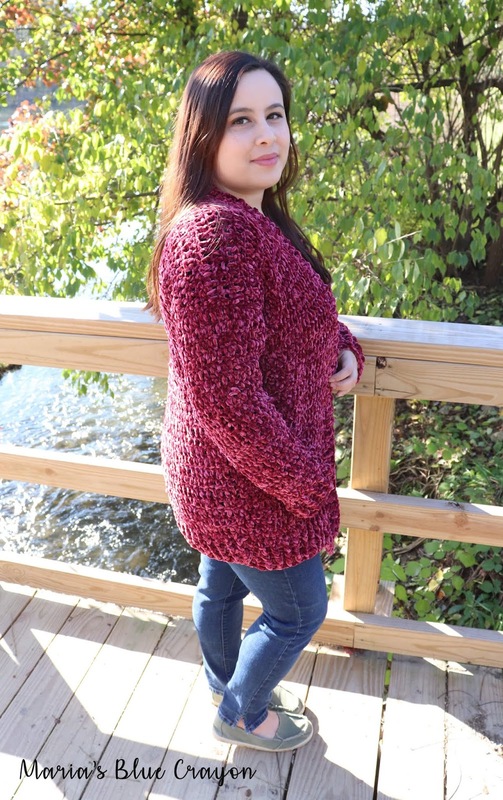 You will see in the pattern that I have added instructions on whether you would like to make your cardigan “short, average, tall” in addition to the typical sizing (small, medium, etc). 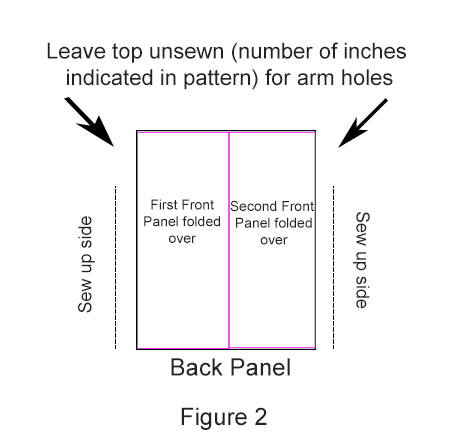 I know how frustrating it can be when you are not the average size so I hope this extra addition to the pattern is helpful for you! One thing I have to caution you on this yarn is that it is very delicate. When you crochet with it, it is wonderful and frogging (ripping out your finished work) is no issue but when it comes to seaming you need to be careful not to seam too tightly. I also added in the pattern notes that you may want to use stitch markers to assemble your pieces and try it on to make sure it fits well before moving onto the actual sewing. From experience, taking out sewn pieces results in the yarn coming apart and takes far too much time because it’s difficult to see. Purchase the ad-free PDF on Ravelry or save it to your queue. Don’t forget to give it a heart as well – thank you so much for your support! Sharing in any way really helps my blog – thank you! The overall construction of the cardigan is as follows: You will begin crocheting the ribbing for the bottom of the back panel of the cardigan and then working the main body of the cardigan. You will continue to work to make the first front panel. 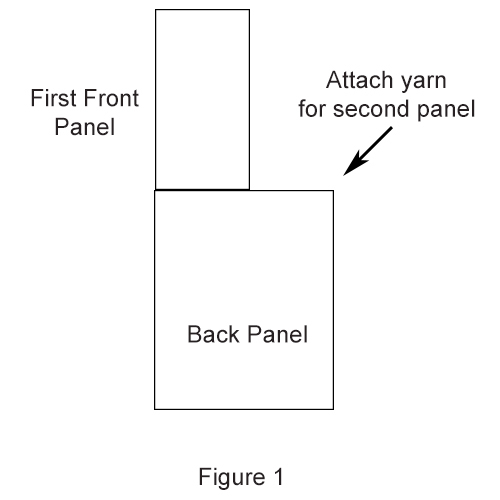 You will attach yarn to the back panel to make the second front panel. Front panels will be folded down onto the back panel and sewn up sides leaving room for arm holes. Sleeves will be made separately, folded in half and sewn up the sides and onto the body of the cardigan. Edging will be crocheted around the front panels. Sizes/Fit: This cardigan is comfortably fitted. The front panels will be fairly open and will not cover the entire bust for most sizes. The panels may seem not wide enough until you do the edging. You may add more edging if you’d like. If you are between sizes, I suggest going up a size. In addition to bust sizes, I have adjustments in the pattern for short, average, and tall heights. 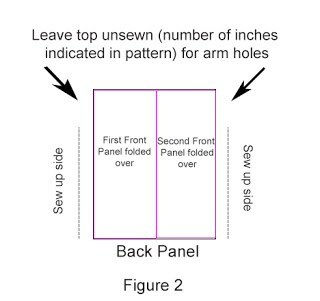 I have the cardigan pattern written out so it hits several inches below the hips, but you can make yours as long or as short as you’d like by reviewing the below how long each cardigan will be with height adjustments. You may also choose to make it shorter or longer by decreasing/adding rows for each panel made. You will see these heights in parentheses when making the back and front panels. This will complete the back panel, DO NOT fasten off. We will begin working on one of the front panels that will later be folded down onto the back panel. Repeat instructions from panel one. This will be the wrong side. Keep it wrong side out for now. 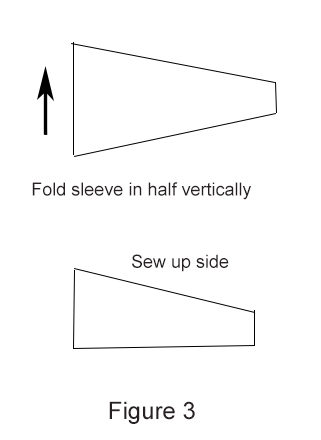 Make 2 sleeves. 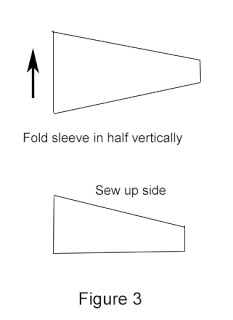 Sew sleeves onto main body where holes were left for arms. Be sure not to sew too tightly with the velvet yarn. Turn inside out, this will now be the right side of your sweater. 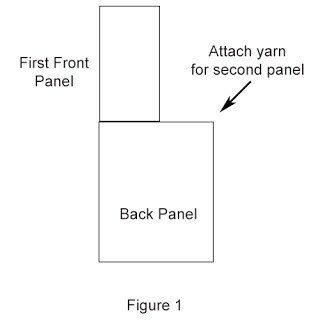 Attach yarn to bottom corner of front panel. Ch 3, *fpdc, bpdc, repeat from * around, fpdc in last st if needed. *Note: You may add more edging as you’d like by repeating the last row.